On Tuesday evening, February 26th, Our Lady of Częstochowa In Her Icon arrived In Toledo which is a very important place for the history of Spain and is the headquarters of the Primate of Spain. It is also a famous tourist centre, which amazes the visitors from around the world with its location on a mountain over the gorge of the Tejo river, its splendid architecture as well as its art and handicraft. The Icon came in Her “Life Mobile” to the old city and entered the splendid church of San Juan de los Reyes, and next was carried to Palacio de Fuensalida, where the Roman-German empress and queen of Spain, Isabella of Portugal (the wife of emperor Charles V) died. She was praised by St. Francisco de Borja y Aragon SJ, one of the key personages of counterreformation in Spain. It was him who had the body of empress Isabella transferred from Toledo to Grenada. Later at 11PM the Czestochowa Icon was carried to the chapel of permanent adoration which is situated behind the office of the bishop of Toledo. It was venerated throughout the night. In the morning, February 27th, at 8 AM the “Life Mobile” took the Icon across the old town to the church of St. Julian, the archbishop of Toledo from the 7th century, a theologian and writer, the patron saint of the city. 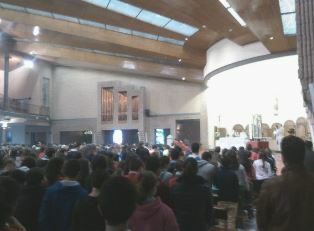 At 8.30 AM the first Holy Mass was celebrated. The second even more solemn Holy Mass was celebrated at 9.30AM. The church was full. The organisers estimate the number of people attending to have been over one thousand, as well as around 600 children from the local schools. The Primate of Spain, archbishop Braulio Rodríguez Plaza had planned to preside over the Holy Mass, however he had to go to Rome because of pope Benedict XVI abdication. A special delegate presided over the Holy Mass on his behalf. After the Holy Mass, when the Icon was carried out of the church of St. Julian in Toledo, a military orchestra of the Toledo infantry unit was playing. The anthems of Poland and Spain were played. After the celebrations in Toledo finished, after the solemn farewell, the Mother of God went to visit Avila, the town of St. Theresa the Great. It was snowing, what does not occur often in Spain, but the road was good.